STATEN ISLAND, NY — The most important factor in photography is time. Or maybe it’s light. Or neither. What are time and light if there’s no contrast? 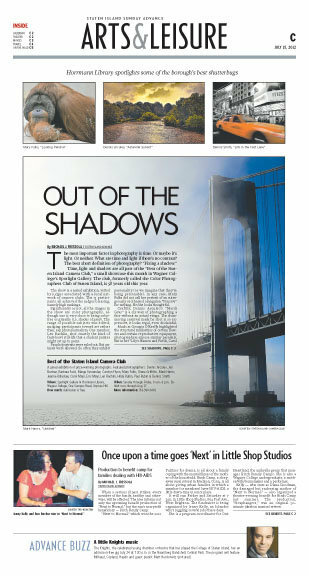 Time, light and shadow are all part of the “Best of the Staten Island Camera Club,” a small showcase this month in Wagner College’s Spotlight Gallery. The club, formerly called the Color Photographers Club of Staten Island, is 58 years old this year. FREE Exhibit of prize winning photographs by club members will run through Aug. 17. The participating photographers are Dennis Arculeo, Jen Burtner, Barbara Feist, Marge Fernandez, Carolyn Flynn, Mary Fulks, Diane Griffiths, Mark Harris, Jeanne Killackey, Carol Mayr, Eric Mayr, Len Rachlin, Hilda Rubin, Paul Rubin and Dennis Smith. Check the Wagner College Web site for library hours and directions.